Sharing stories of how God has impacted our lives encourages us and builds our faith. It’s one of my favorite things to do! The Women Wielding The Word series is meant to be an encouragement to you. I’ve asked other bloggers to share what their time with God looks like and how the Bible has impacted their lives. We all have a different story. How we came to know Jesus as our Savior, what our lives looked like before and after, how we’ve grown in our relationship with Christ and our understanding of His Word… our experiences are as unique as we are! Today’s guest is Samantha Sali. She shares openly about her journey from a devotional life steeped in obligation and inconsistency to a lifestyle of continual communion with Jesus. There’s no hiding what her reality looks like and her authenticity is refreshing! My personal time with the Lord looked a little differently before I became a mom. As a freelancer and student, I woke up around 9am, ate breakfast, turned Chris Tomlin on low, and opened my Bible in the silence of my apartment. I’d find myself a little distracted and sometimes I’d cut my devotional short in favor of responding to emails or turning on Netflix for just one episode of The Office. To end of the day, my husband and I would have couples’ prayer and devotional time. Before the sun rises, I throw together breakfast, change his diaper, throw on PJ Masks on the Disney Channel, and try to sneak in some personal Bible time. If I don’t do it then, it probably won’t happen the rest of the day. My schedule is filled to the brim with caring for my family and pursuing my career as a writer and journalist. By the time my little one goes to bed, I’m too wiped out to even spend time with my husband. My evenings usually end up with me shoving chocolate in my mouth while binging Netflix before passing out. There are days, weeks even, that I miss Bible time in favor of just closing my eyes on the couch or sneaking in some work before our day starts. On those days, my patience wears thin at a much faster rate and I feel immensely guilty for putting God on the back burner. I don’t want it to be like this, so I vow to try harder. The light bulb went off and I realized that this was so obvious! I still tried to set aside Bible time each day, but I didn’t beat myself up if I missed it because I had brought God into all parts of my life. In the morning, during chores, I started listening to Christian podcasts. During playtime, I’d talk to my son about God through the toys we were playing with. If I had time to read a book, I’d pick up a devotional or other book that encouraged me in my relationship with Christ. At nap time, when I’d have to do some writing, I started cranking up Pandora worship stations. I downloaded apps like FaithPlay, iDisciple, and TBN, to occupy my downtime instead of opening Netflix or Facebook. I started receiving Bible verses on my phone too. During laundry, I’d pray over my family. During my shower, I’d pray for my walk with the Lord. During my daily workout, I’d praise Him for an able body and ask for support in caring for the temple He gifted me. I created a prayer wall in my son’s room so we’d be able to pray over our loved ones while we were in there. When my son and I would go outside, I’d pray out loud and we would thank God for the beautiful creations He blessed us with. On particularly rough days at home, when tension was high, I’d walk around the room and ask the Holy Spirit to fill the home with love and peace – my son would follow, waving his little arms around, giggling as I declared Satan had no power over us. I noticed that my relationship with Him became closer than ever when I stopped forcing a specific time each day to read the Bible. My relationship started feeling less like an obligation I needed to fill and more like a relationship between a parent and child. The Lord had started to become my best friend. I got into the habit of talking to Him as soon as I needed help or as soon as a prayer was answered. There was a constant flow of Him and I, together. I was able to stop the poor relationship I had with the Lord, where He was the boiling rice I forgot about on the back burner while trying to make dinner. My pursuit of Him was often forgotten about, plain, boring, and slow to grow. When I implemented these changes, the Lord got a seat at my table. We broke the bread, we had long-night conversations, I made him a part of the family – the leader of our home – and I’ll never look back. 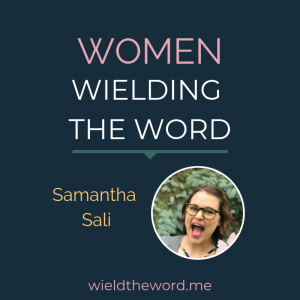 Samantha Sali is a published author, journalist, wife, mom, and daughter of the King. She is deeply involved in advocating against interpersonal violence and Her writing has been featured on many platforms including, Washington County Insider, Kettle Moraine Neighbors Magazine, Elsie Road Magazine, The Speckled Goat, and The Quiet Place. She lives in Southeast Wisconsin with her husband & son. Website: www.samanthasali.com Instagram & Twitter @samantha_Sali. Read the other posts in this series here. This was a very inspiring read! I totally remember some of the same feelings as a young mom. Now as a grandma, there is still lots of room to learn ! Yes. There are many lessons I know I’ll be learning until the day I meet Jesus face-to-face. Life never does really settle into a routine (Just my experience, maybe it does for some? ), and I think God uses that reality to test our determination to make Him our priority. Your thoughts here are a real blessing! I’m with you on that one, Michele. I’m not sure I’ve ever managed to maintain the same routine for longer than a week! 🙂 For me, God uses it to remind me that I’m not actually in control. It teaches me to rest in Him. I find myself in that same place. Trying to juggle all the wife and mom responsibilities and stay connected with my Father above. It helped to accept that it doesn’t have to be quiet for me to read my Bible and study! Oh, Aryn, I’ve been there! I wrote a post about “The Ideal Quiet Time” because I used to miss out on time with Jesus. I was waiting for that perfect time and place to appear, but it never did! For a season, I, too, had to become comfortable with a little chaos with my Bible reading and prayer time. Thankfully, and in God’s grace, it was temporary. Great tips for young mothers! My daughter is due with her first child within the week, and this would be helpful to her. I’m going to send it along to her! I’m glad it was helpful, Tracey! May your daughter be encouraged. And congratulations on the baby! Thanks for sharing, Samantha! I love these ideas for ways to incorporate focus on God into all the different activities and parts of the day. Wonderful post, Samantha. I remember well those days when I had 3 young boys at home and it seemed like I could not find even 1 minute to myself. Now I am a grandma and have more time, but a reminder to prioritize time with God is always welcome. Wow! What a game changer! As moms we all struggle to fit in sit down time, I love how relationship with the Father was woven into the very fabric of life, a natural and doable way to do life. Yes, Katrina, learning to “abide” with Him is an absolute delight – far beyond simple duty. A wonderful way of life. I’ve been listening to the scriptures rather than reading them on my commute to school. That has really been helping me get time in. Excellent! make it a talk and speak at MOPS!! God is in our days, we just need to open our eyes. Great post. I simply can not do this life without Him! Thanks for sharing honestly, Samantha. I remember those days of busyness when the kids were little! He just wants us to talk to Him, to think about Him, to go to Him – it doesn’t always have to look the same! And each season of life will look different. Thanks for linking up on Grace & Truth.